Yes, we hate plastics! Not only is this evil material bad for our environment, over and over again the news reports the negative effects of plastic chemicals on our children’s health. From BPA to phthalates, plastics are to blame for a slew of health problems. Now, a long term study of girls living in Harlem has linked exposure to the chemicals in plastics to childhood obesity. Yes, plastics make kids fat, well at least there is a correlation. The heaviest girls have the highest levels of phthalates metabolites in their urine. It goes up as the children get heavier, but it’s most evident in the heaviest kids. When we say children, I’m talking about kindergarten children, we are talking about little kids. This is a problem that begins early in life. “Growing Up Healthy in East Harlem” has been studying over last 10 years children’s health factors, including pesticides, diet, and proximity to bodegas. 40% of children living in Harlem are overweight or obese, and the study found the levels of phthalates measured in children are significantly higher than the average levels reported by the Centers for Disease Control and Prevention for children across the entire United States. If plastics act as endocrine disruptors then what is the other alternative? The alternative is to avoid plastics or plastics containing phthalates. With over 50 years of research, phthalates are among the most thoroughly studied products in the world. The latest research findings and current understanding of the health and environmental effects of phthalates clearly show that they do not pose a risk to human health or the environment. It is now scientifically accepted that the carcinogenic effects produced by phthalates in rodents are species specific and of little relevance to humans. The environmental impact of phthalates is considered to be low due to their ready biodegradability and low toxicity. Plasticisers in general and phthalates in particular are currently the subject of considerable media, legislative and scientific debate. This is not new. Concerns regarding plasticisers have been raised on a variety of topics at regular intervals ever since the early 1980’s. These have included carcinogenicity, environmental effects, oestrogen mimicking, phthalates in toys, and most recently exposure via medical devices. However, any fears have repeatedly been shown to be unfounded. Plasticised PVC has been used for more nearly 50 years without a single known case of it having caused any ill-health and the environmental effects of phthalates are known to be minimal. Academia and industry have continually worked together to address the concerns and conduct necessary research. Indeed there is more known today about phthalates than almost any other chemicals. Unfortunately, politics play an increasingly important part in any debate relating to chemicals but, in the majority of cases, a scientific approach to the concerns has been adopted by the authorities. Indeed, it is as a consequence of the large amount of scientific research that has been carried out and also because flexible PVC makes such a valuable contribution to modern life that plasticiser usage continues to grow. EU risk assessments, conducted under the Existing Substances Regulation (793/93/EEC), have now been published for three of the five main phthalate plasticisers (DINP, DIDP and DBP) and those for the two others (DEHP and BBP) are almost complete. For DINP, DIDP and DBP there are no risks identified for any application in which they are used. In the case of the risk assessments still being finalised it has already been agreed that the general population is not at risk from the use from either plasticiser. Attached are useful articles on the issue. See also: http://www.americanchemistry.com/s_phthalate, http://www.ecpi.org, http://www.vinyl.org and http://www.phthalates.org for more info. Suffice to say that to some extent confusion does currently reign as to how serious the issue is and who is worse affected. From a South African perspective, we are not aware of any “Governmental Health control type body” getting involved in the matter and we are not yet corresponding with Government with regards to possible legislation. It makes sense to wait for more accurate scientific findings from the USA [say] before going that route. Another obvious comment is that if any South African is worried about possible health consequences – then they must refrain from buying / using PVC toys or other items opposite their babies or small children. Technologists in Europe and the Americas have been and still are active in implementing alternatives to any potentially “nasty” phthalates and one can expect that the responsible suppliers will and do supply PVC products that do not harm. Certainly some suppliers of PVC have already converted to alternative phthalates. Those with overseas parents or adequate own laboratories are in a particularly good position to institute changes. How do you avoid plastics and still drink filtered water? Do you know which products are safe? Wow. Great find, Jennifer. 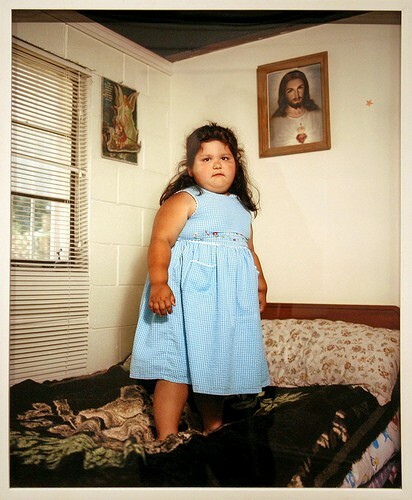 ….and what a sad little girl. That is a great illustration too. That child is not going to be jumping on that bed. Endocrine Disrupters (ED) are chemicals that occur in theenvironment typically as the result of industrial processes. They areoften quite stable and therefore persist in the environment for longperiods of time. They can be present in the air, water, and foodsupply. They can also be present in the containers in the foods we eat. Endocrine disruptors can interfere with normal hormonal regulation by mimicking or interfering with the action of hormones normally produced in the human body. In terms of what we can do about them, as a society we can try to identify those ED that may be the most troublesome and seek ways to reduce or eliminate them from our environment and to reduce or eliminate the production of them. I just read thru the selected results in the study and from what I read it looks like they are attributing the obesity more to the result of no access to healthy food. And BPA and phalates store in fatty tissues, so aren’t overweight people going to have more in their blood regardless? So what comes first? Too many phalates and you are more susceptible to gain weight or is it because you are overweight you have more of these toxins in your blood? I do not question that these toxins are a huge issue and need to be regulated and even banned. I am just wondering if it is our sedentary lifestyle and unhealthy eating habits that lead to our bodies having more of these endrocine disruptors. So can we really blame industry or should we be looking at our lifestyles and make conscious changes to the way that we live. This is reminiscent of the debate on electro mechanical fields and its harmfulness. There is something called dishonest research probably because there is an influential industry that attracts a career and funding for your research. It should be taken into account when one sees an influential industry defended. In our family, we avoid petroleum products and their additives as much as possible.